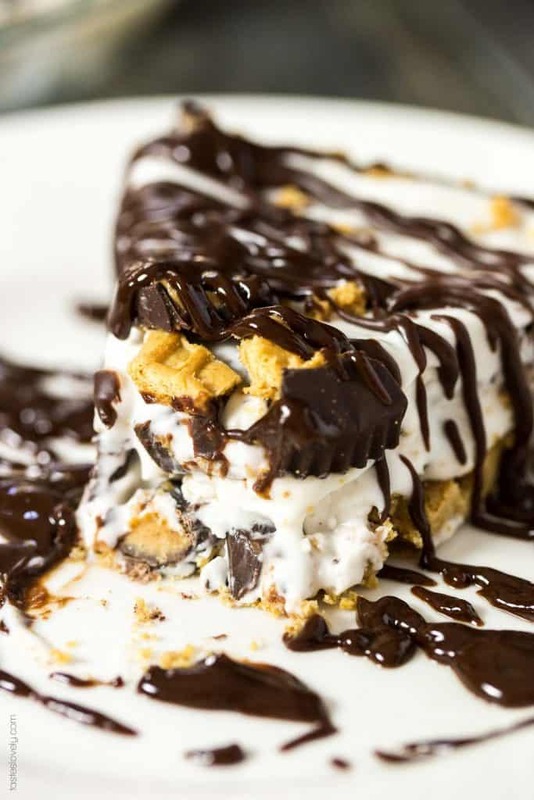 No bake Peanut Butter Lovers Ice Cream Pie – store bought vanilla ice cream jazzed up with chopped up peanut butter cups, on a NUTTER BUTTER crust and an easy microwave peanut butter chocolate sauce drizzled over when serving. 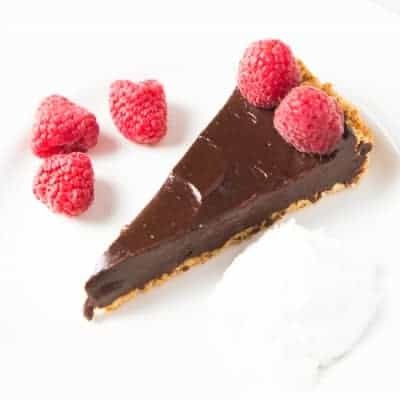 Such a simple dessert to throw together! Pausing live TV can be risky. Lately I’ve been turning the news on in the morning. It’s been great background TV while Josh and I get ready for the day. The other day I paused the news and went to go make myself breakfast, clean the kitchen and play with Josh. After putting Josh down for his morning nap, I pressed play again. I did some emails, and completely forgot about pausing the show. I was going off the time displayed on the news, and was feeling so accomplished! Josh and I are both fed, the house is clean, I’m showered, dressed AND have makeup on, and Josh is already down for a nap?! And it is only 8:18? Go me! I was having my very own mini party, and when Josh woke up from his nap I loaded us up to go the grocery store. It wasn’t even 9am yet! It was going to be a great day. But then I got in my car and was so confused when the clock in my car said 10:45. Huh? That’s weird, the clock in my car must be off? Wait, my phone says 10:45 too. What the? Oh MAN! I paused the news! That time wasn’t right! I’ve done this 2 other times since then. You would think I learned my lesson the first time. So I’ve made a new rule. No more pausing the news. Or it’s just going to feel like time is getting away from me. 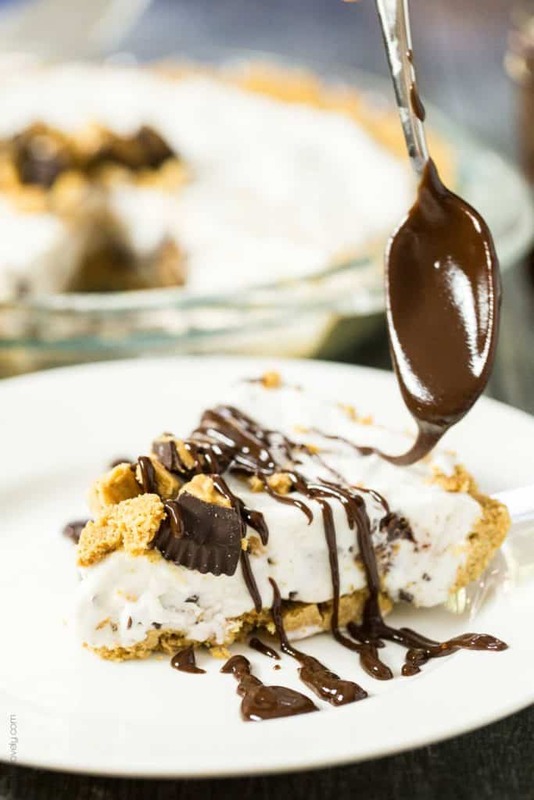 If I ever need to feel like I need an abundance of time, I just need to make this peanut butter lovers ice cream pie. 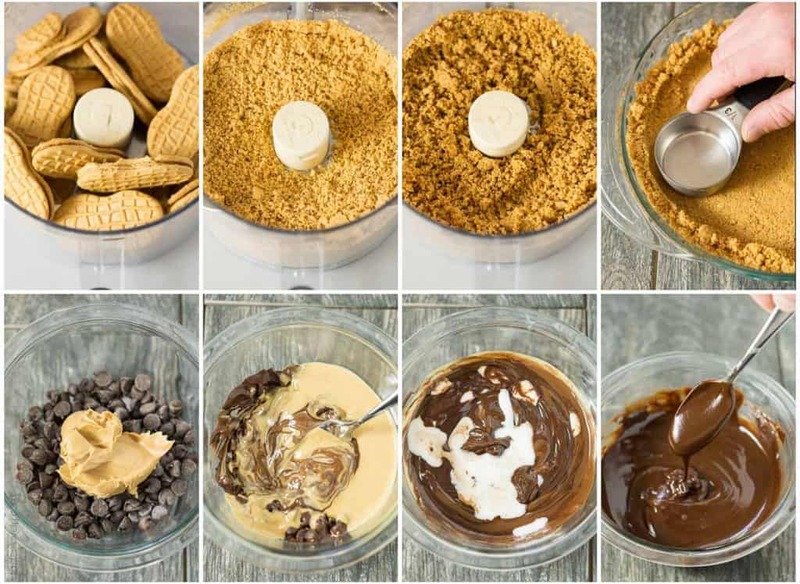 It takes barely any time to make and it’s the easiest no bake dessert in the world! But more importantly, it is delicious. 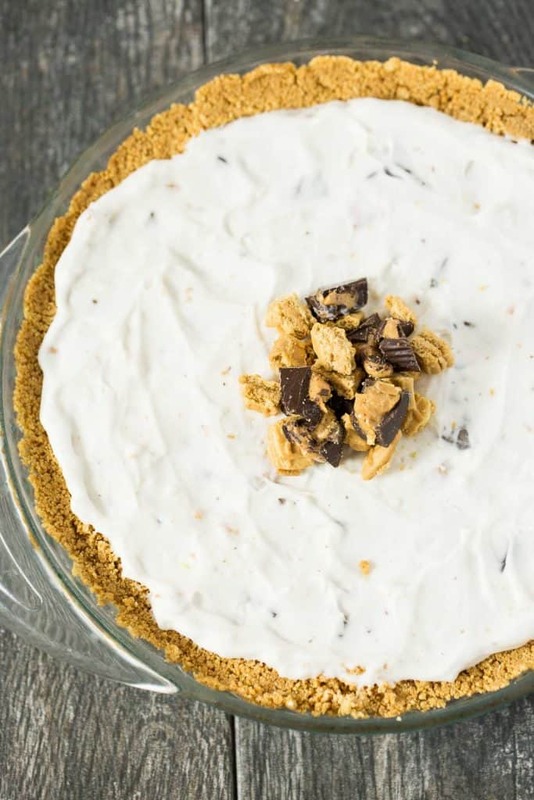 I’ve made this peanut butter ice cream pie tons of times when having people over for dinner, and the pie is gone by the end of the night. Everyone loves it. I take store bought vanilla ice cream and mix in chopped up peanut butter cups. If you’re feeling extra fancy you can make your own ice cream, but really, store bought is much easier. The best part is the NUTTER BUTTER crust. Don’t you just love NUTTER BUTTER cookies? They easily transform into the best pie crust you’ve ever had. 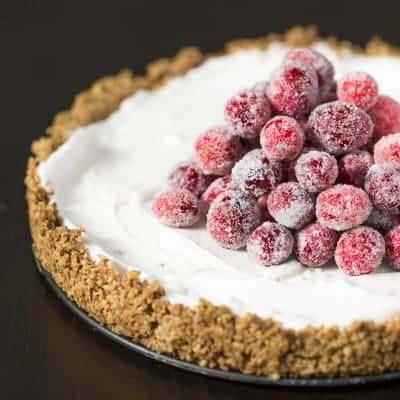 Just chop them up in the food processor, add in some coconut oil to bind them, press them in to your pie plate, and pop it in the freezer to firm up. No need to bake it! The crust and ice cream filling take less than 10 minutes to put together. Ready in a snap! Right before serving I make the microwave peanut butter chocolate sauce. It takes less than 5 minutes to make too. 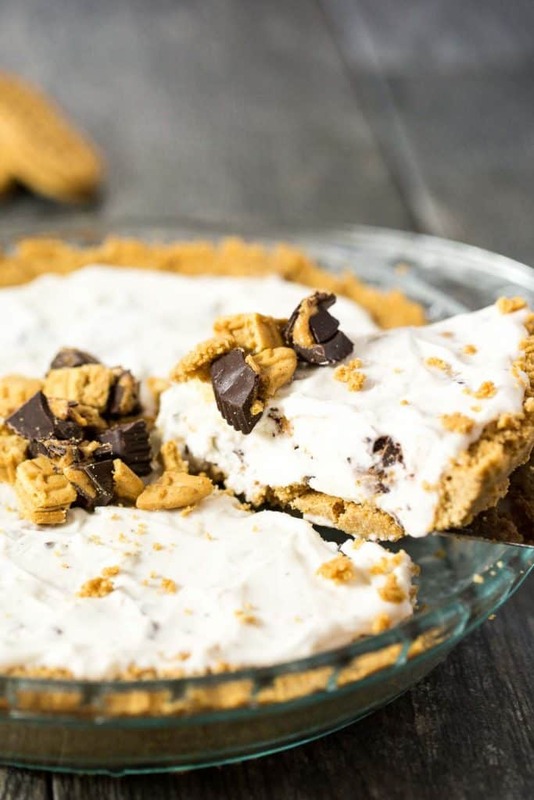 This peanut butter lovers pie is perfect to serve year round. I’ve served in the summer, I’ve served it in the winter. Any time is a good time for ice cream pie. 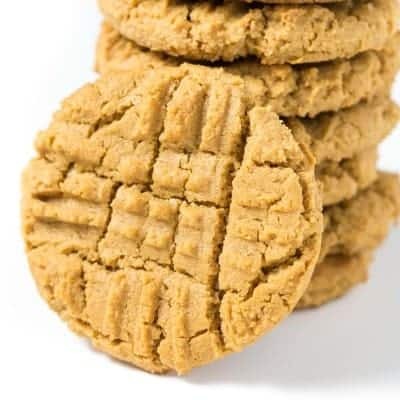 Put the NUTTER BUTTER cookies in a food processor, and pulse until they are crumbs. Add the melted coconut oil, and pulse until combined. Will look like wet sand. 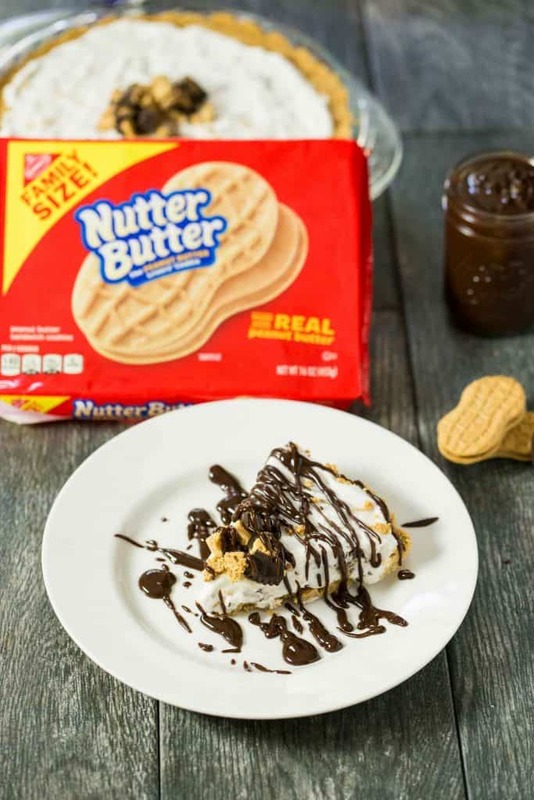 Pour the NUTTER BUTTER crumbs into a 9″ glass pie plate. Spread and press into an even layer, and up the sides of the pie plate. While the crust is freezing, take the ice cream out of the freezer to soften for 20 minutes. After it has softened, scoop the ice cream into a medium size bowl. Add the chopped peanut butter cups and fold to combine. Pour the ice cream filling into the frozen NUTTER BUTTER crust. Spread in an even layer. Freeze until hard, about 2 hours. In a small microwave safe bowl, combine the chocolate chips, peanut butter and coconut oil. Microwave for 1 minute. Allow to sit for a minute. Then stir. Microwave for an additional 30 seconds if necessary to melt completely. Add the heavy cream and pinch of salt. Stir to combine. Transfer to a mason jar or container. Leave at room temperature. Remove from the pie from the freezer. If your pie has been freezing for longer than 2 hours, let it sit at room temperature for 20 minutes so it is easier to slice and serve. Slice, drizzle with the chocolate peanut butter sauce, and serve immediately. 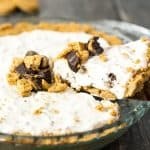 -You can really easily make this ice cream pie dairy free and vegan! Just use coconut milk vanilla ice cream, get vegan chocolate chips and peanut butter cups, and substitute coconut milk for heavy cream in the peanut butter chocolate sauce. This post is sponsored by NUTTER BUTTERS. All opinions are my own. Thanks for supporting the brands that support me! What a perfect summer dessert! My family will adore this, thanks!